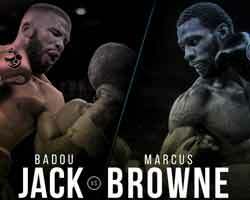 Review by AllTheBestFights.com: 2019-01-19, fight not so exciting between Badou Jack and Marcus Browne: it gets two stars. The former Olympian, former Wbc super-Mw and Wba light-Hw champion Badou Jack entered this fight with a pro boxing record of 22-1-3 (13 knockouts) and he is ranked as the No.3 light heavyweight in the world (currently the #1 in this division is Oleksandr Gvozdyk) but two out of his last three fights ended in a draw: against James DeGale (4-stars fight, DeGale vs Jack) and Adonis Stevenson (Adonis Stevenson vs Badou Jack); between these two bouts he beat Nathan Cleverly (Nathan Cleverly vs Badou Jack). His opponent, the undefeated Marcus Browne, has a perfect record of 22-0-0 (16 knockouts) and he entered as the No.9 in the same weight class. In his last three bouts he has won over Sean Monaghan (Browne vs Monaghan), Francy Ntetu (Marcus Browne vs Francy Ntetu) and Lenin Castillo (Marcus Browne vs Lenin Castillo). Jack vs Browne is valid for the vacant WBC Silver light heavyweight title; undercard of Manny Pacquiao vs Adrien Broner. Watch the video and rate this fight!